Hola for the final time from the Mexico Missions Trip Team in San Vicente Mexico. This being the last day, since we are leaving in the morning, I would like to thank those who read the blog faithfully all the time we were in Mexico, and I would like to say that I really enjoyed writing it, and sharing the memories that we have made over here with friends from home. I got the opportunity to go up to Colonet and help John Leskajan, one of the team members, cut steel for the gate that we built for the church up there. It was bittersweet to say goodbye to the friends I have made here, and I have gotten names to stay in touch on facebook. Today we put even more hard work in on the foundation for the home we are building. We are still mixing concrete and pouring it around the foundation. Some of the team went up to Colonet to teach the locals how to weld and to build a new gate for the church up there. We also had the opportunity to have dinner at Nati's house, who is a woman from the Casa. She gave us her testimony of how she came to Christ. Hearing what she went through really gives you a sense of the power that the Lord has to meet people where they are, and redeem them. The details of her testimony are very graphic, so I think its better to leave them out. On a more positive note, she is an exemplary cook. She cooked us " verde pollo " which in english means " green chicken " but it translates into spanish as chicken with green sauce. She also made tamale, and fried rice on tostada. She then proceeded to buy us ice cream and jello, which is very generous, considering how little money these people have. When I asked some of the team which verse from the bible they would pick if they had to sum up the trip in one verse, one of the ladies said " Psalms 127 : 1, unless the lord builds the house, the builders labor in vain ". I think that hit the nail on the head, because I believe we need to remember that the only reason we are here in Mexico is that God wanted us to come, and he had a purpose for us to achieve here. It is always important to pray and ask God if what you are doing is what He wants you to do, and if not if He can set you back on the right path. Here you see the hard work that is put into building the foundation of the house. Please continue to pray for us and for the that is happening here. Please pray that God blesses it. 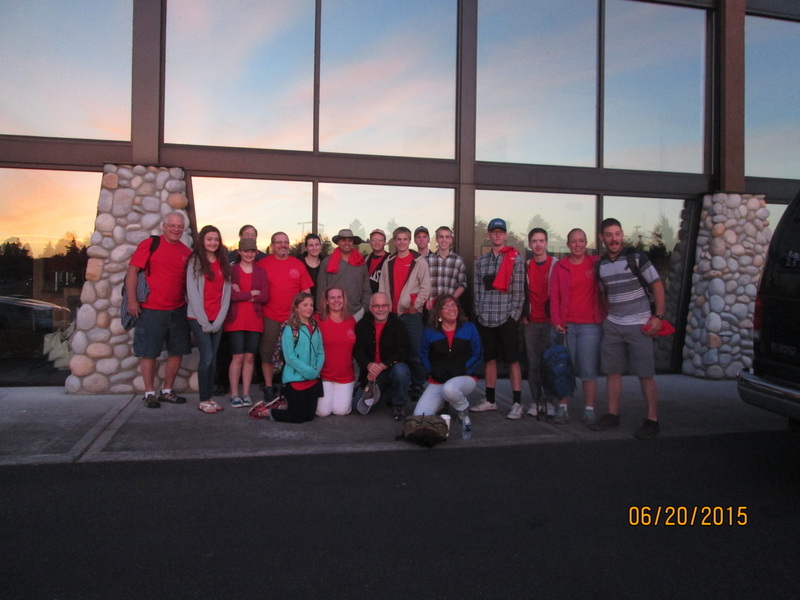 Hola once again from the Rainer View Christian Church Mexico Missions Trip Team. Today, people from the other projects came to help us again on building the foundation for the house of one of the moms from the Casa. The stage that was worked on by part of the team in the church in Colonet was finally tested out by Rudy and the Colonet worship team. They really enjoyed being able to use it, and Rudy said that he is short but the stage made him feel tall. At the end of a women's bible study up in Colonet, in which we had to keep track of many, many rambunctious little kids, Rudy decided that he wanted us to sing " I am in the lord's army " on the new stage. All the stomping involved in that song really tested the strength of the foundation of that stage. However, it did not budge a bit. Then he said " Cmon guy's to the rest of the congregation and said " ok now let's do it in spanish ", and they went up there onto the stage and sang the same song, in spanish, proceeding to stomp even more on the stage while singing. With all this stomping going on on top of this stage, it did not move, sway or crack one inch, so thank you to the portion of the team who built that stage. Rudy then decided that he wanted to celebrate the one year anniversary of two of the people who went on this trip, Emma and Billy. He showed pictures from their wedding, brought three different cakes, and distributed them amongst everybody in the church. It really added to the evening. Tommorow we are going once more to work on the foundation of the house for the mom from the Casa. We are trying to make as much progress as possible with that whole project befoer we have to return home. Hola once again from the Mexico Missions Trip Team. Today we put in more work on the foundation of a house that we are helping to build. There was a lot of mixing concrete and pouring it, which if you are new to it, is really backbreaking. It was 300 Kelvin out today, which translates as 80.66 degrees farenheit. We had the assistance of some of the locals of San Vicente today, digging around the foundation, helping out with concrete, and so on. Their names were Chino, Felix and Miguel, and I would like to thank them for their help. Chino had gotten there earlier in the morning and had already been at work for a while when we got there. Another project that was going on at the same time was the construction of the stage for the church in Colonet. 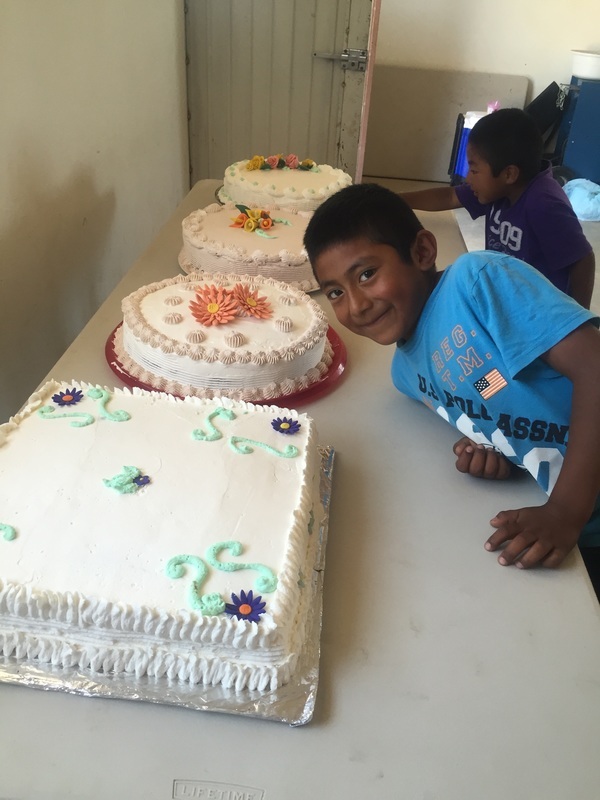 This was from a couple days ago at Colonet where we served a bunch of the locals lunch, which was quite a banquet, including about 200 hotdogs, several, several bags of chips, watermelon, and as you can see, cake. Tommorow people are starting to job shadow Steve Hamilton, something that I, among other team members, have the privilege of doing. We will return to the foundation tommorow to finish it up by leveling the floor after some bricklayers come by. With the hot water project, the stage project and the foundation project all going on at once, sometimes things can get a little hectic so prayers from home are always appreciated, or from anybody else reading this blog. God bless. Bien Dia ( Good Day ) from the RVCC Mexico Missions Trip Team. Today we got to work on the foundation for Steve Hamiltons new house, cutting wire, clearing out dirt so that a solid foundation could be laid, and pouring cement. Other projects that were done included providing clean water for one of the ladies who works at the Casa ( the mission that Steve Hamilton works at as well ). I think today was a very good example of how God steps in at the last moment but always makes sure that his will is done. While we were working on laying the foundation for Steve's home, we got to a part of the the project in which we did not have enough people to complete it. At that moment, a bunch of people from another church that had come on a missions trip came over over with a bunch of tools and asked where we needed help. Believe it or not, the name of their church was Cavalry. The Lord sent the Cavalry to achieve his purposes. Another thing we did was go to the Casa for a community birthday party with all the kids and the mothers. That was awesome to experience as well. The kids got to take a swing at several different pinatas. A kid from the Casa proudly shows off part of a Spider Man pinata. This was a pretty common sight. There were lots of kids walking around with different parts of different pinatas that had been demolished by the kids. The little girls at the Casa take their turns at the pinata. Those silver spikes on the side of the pinata with streamers on them apparently served as cool looking hats after they were knocked off. Pastor Rudy's ministry focuses on children and growing families. Before service, he has the kids come up and recite scripture. Today they sang a song about Jonah and the Whale. 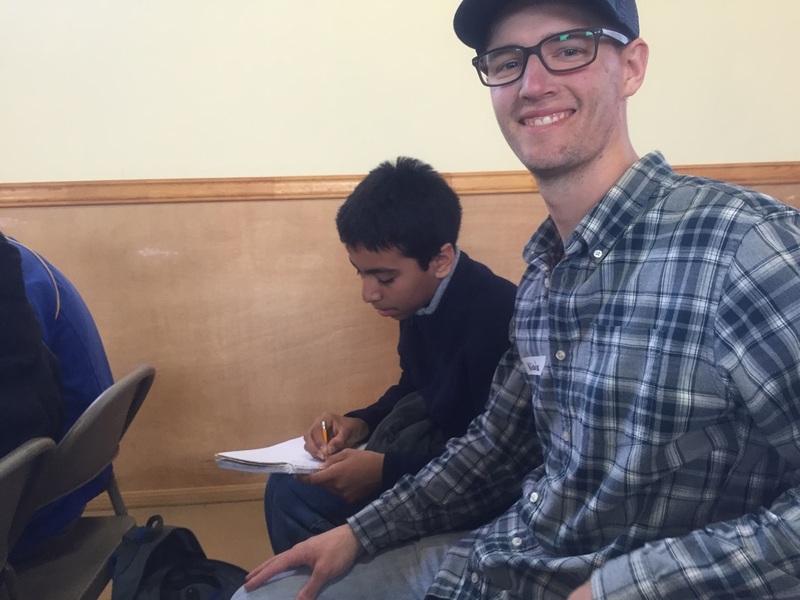 Nicholas and Andre share notes in church. Andre was writing down Spanish words for Nicholas. 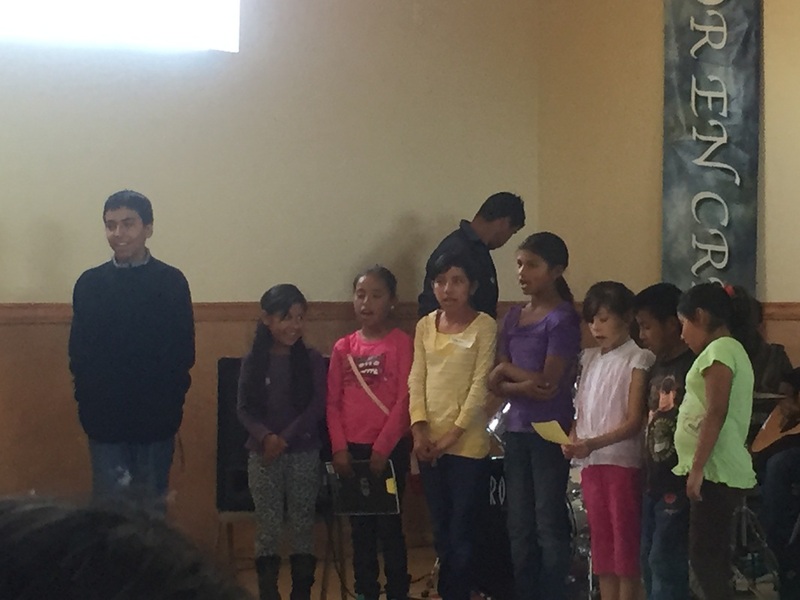 The children singing at Colonet during the church service. 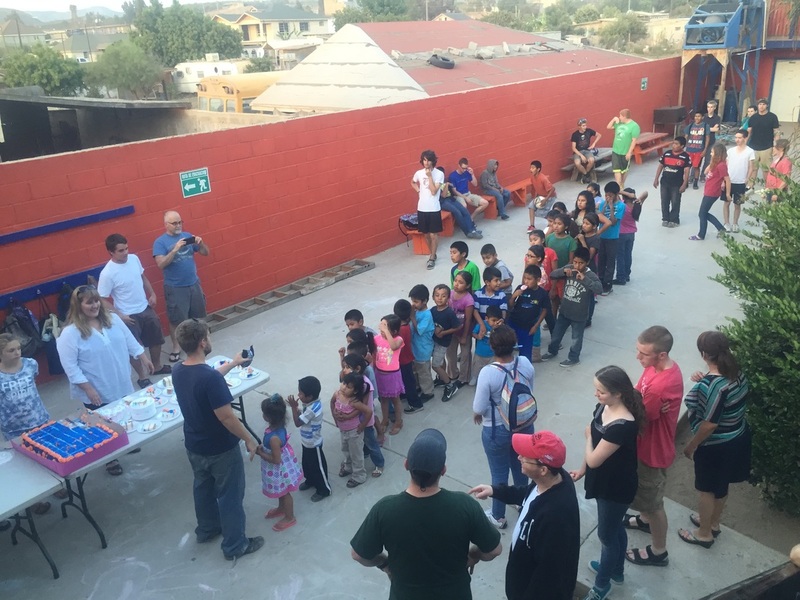 Hola once again from Matt Schooley on behalf of the Mexico Missions Trip Team. Our second day in Mexico has been productive, as well as enjoyable. This morning, some of us went to church in Colonet as well as San Vicente. Most of the hymns that were sung in the church in San Vicente were just Spanish versions of the songs we sing in church. Some of them were " 10,000 Reasons" , and " Your Grace Is Enough ". Some of the kids from the church decided to put on a drama skit set to music as well. #1 : What has been your favorite experience so far ? #2: How did it make you feel to see how little that these people have, and the poverty that they live in ? #3 : Where do you feel like God is leading you to serve on this trip, and where did you feel like you were fulfilling a need the most today ? So, first I asked Lydia Helt about what her favorite experience has been so far. She said " Probably playing with little kids. I noticed that at home, when we are done with church, we just go home. Here it was different. After church people stayed and actually talked to each other. There was more of a sense of community. " That is something I noticed as well, and which made me feel at home at the church in San Vicente. I then asked Lydia how seeing how these people live and the poverty they live in made her feel. She said " It makes me feel like the problems we get frustrated at are petty. These people find value in simple things that we often take for granted. " The last question that I asked her was where she thought God was leading her to serve and where she felt like she was most fulfilling a need today. She said that " I think God is leading me to help out with the kids and with the youth, and just be their friends. I felt that I was fulfilling a need today simply by doing that. " The next person that I asked about the trip was Mitch Stone. He said that his favorite part of the trip so far was " hanging out with the kids and being a part of the church service. It was really amazing to see how a different culture experienced something like church. " . I asked him about the poverty that he was seeing, and he preferred not to comment on it. In response to the third question, he said that " I feel that God is leading me to use my mechanically inclined skills, which used to be purely a hobby to me, to serve him. He felt that so far he has been fulfilling needs by helping out with mechanical stuff ". poverty that these people live in, and how it made her feel, and she was honest with me. She said " I can't put it into words " . When I asked her about where she felt like God was leading her to serve on this trip, she said that she felt like " He just wants me to help out wherever I am needed. I feel like I have fulfilled a need just by being here. " It is truly amazing to experience this culture in San Vicente and Colonet. I think it is also really great to hear about people views on different aspects of the trip.
" very good " . I do not think that there is a way that I can do justice to how much I ave enjoyed this day and I look forward to what the Lord has planned for us next. Stay tuned for more updates ,pictures and videos. God Bless you all back in the USA. Those little Google Street View Cars sure have been everywhere- and for the first time in almost 20 years, they have made it down the Baja to San Vicente, Baja California. Let's take a little Tour before the team goes down. If you view this on your phone and hold it to your face- its like you're actually there! This is the entrance to San Vicente, down Mexico 1 to the Transpeninsular Highway. Here is the park where they hold weekend fresh fruit markets and carnivals. This is the only stop light in town. This is the local Icecream and Coffee shop- notice the delivery truck outside that is usually used to deliver cement from the hardware store. Look at that sign! This is the church many of us built a few years ago for Calvary Chapel- this is where Scooter and Katrina (a local couple) preach and hold Bible Studies weekly.